One of the best free screen recording and video editing software. Has several utilities to take screen shots, screen recordings, and webcam recordings. Includes a more sophisticated video editor that can handle picture-in-picture and other advanced effects easily. Compares favorably to Camtasia Studio, but is completely free. Can export to many formats, as well as import many formats. Has a screen annotation tool too. The only draw back is that it can not record both the screen and webcam at the same time. One of the best free screen recording software. The free edition contains most of the functionality of the paid version, except for several exporting options. Can export to mp4 videos that can be uploaded to YouTube. 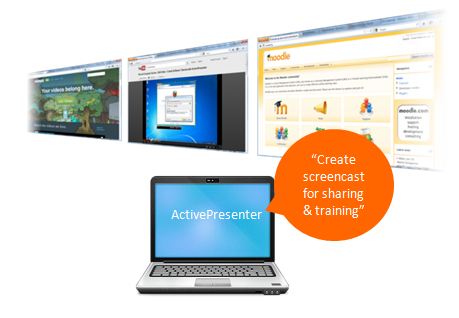 Includes a basic video editor to touch up the recorded presentation. Lacks an option to record the webcam together with the screen. Another good free option for screen recording. Can record both the screen and the webcam. However, the free version lacks any video editing capabilities. A website where you can record online for free, with a paid subscription option. Can record both the webcam and the screen. The free version allows recording of only up to 15 minutes. Also the free version adds a watermark on the published video. Has on-screen drawing and editing capabilities in the paid version. Another website to record online for free. The free option has a limit of only 5 minutes. A free software from Microsoft to record the screen. There is a Pro version, but it is not sold anymore by Microsoft. Has some nice video editing capabilities. Can record both the screen and webcam.